I finally bought an AreoGarden 2 weeks ago. It seems like an expensive toy, but in the dreary winter I need a chance to ‘tend garden’ every day. I wanted to give it a try and see if it could lift my winter blues. It has a sensor that alerts you when you need to add water or nutrients, and a very bright grow light that is on a timer. It’s really pretty foolproof.Granted, it is a little expensive, but I got my 7 pod AeroGarden Classic when it went on the Amazon deal of the day for 99.00 and came with the Gourmet Herb Seed Kit, currently it’s 141.50. They do have a 6 pod one that also includes an herb kit on sale now for 99.00, so you could try that one too. 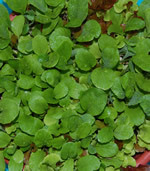 The Gourmet Herb Seed Kit has chives, 2 kinds of basil, thyme, mint, dill, and parsley. 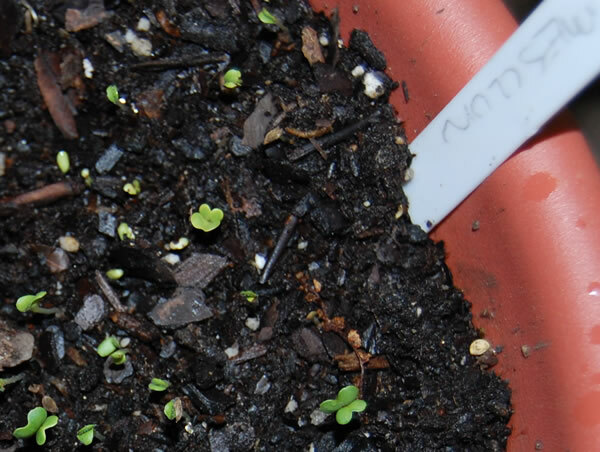 Currently all of my herbs have germinated, and the chives are at about 2 inches. Setting it up was very easy and took about 5 minutes. Just add water, a nutrient tablet, the seed pods, plug it in and you are on your way to harvesting herbs in your kitchen year round. I know some of you already do grow herbs inside all year, and I’m certainly not implying that the AeroGarden is the only way. It’s just an easy way. And if you are an apartment dweller, it’s a great way to grow fresh herbs, lettuce and more. The seed kits are expensive at 19.99 for 6 or 7 seed pods, but they do have a AeroGarden Master Gardener Deluxe Kit, so you can use your own seeds. That is not only cheaper in the long run, but allows you to grow a wider variety of plants. 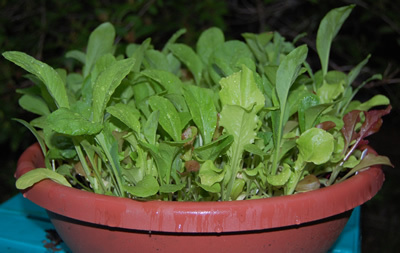 Next I’m going to grow some loose leaf lettuce or arugula. Yum! I’d like to get a second AeroGarden to grow lettuce in at work. It would be amazing to cut the lettuce for my lunch right at my desk. Wondering if it’s green enough for you? Check out this page on the aerogrow site, It answered my questions and it seems like they are trying to do the right thing and improving as they go along. I have been trying to eat more local food, and to reduce my personal impact as far as waste goes. Visiting a few local farms and cheese makers over the weekend got me thinking. They do an amazing job, growing food that I can be happy to buy from them. No pesticides, using well and pond water, rotating crops, and the food I saw growing was beautiful. It’s amazing how many things I do mindlessly, so I am going to be more aware of what I’m doing and why. This should keep me more frugal as well. Next time you go to a fast food restaurant, really look at the amount of trash that’s generated in just that one meal. It’s amazing that we have are so distanced from our food, where our waste goes, and how our food is grown. This week my meal plan revolved around what I bought at the market. I think that’ll help me not waste what I buy. Encourage me to really think about where the food came from, why I’m choosing to serve it to my family and friends – a cooking meditation of sorts. I have been thinking about landscaping my yard – adding more food into the mix. Today I got a few bare root plants I’m going to use. They were on the sale rack, so if they don’t all make it I’ll be ok. I got 2 varieties of strawberries, black raspberries, blackberries, and 2 varieties of grapes. I have 2 blueberries already, though it looks like one of them may not make it through the spring. I would really like to produce more food and put some away for the winter. Right now I have 10 tomato plants – 6 purple cherokees, a striped german, a pineapple, and 2 patio tomatoes. My hope is to at least freeze some, and I’d love to learn how to can. It’s ambitious, and I won’t be able to do everything I want to, at least not all at once. 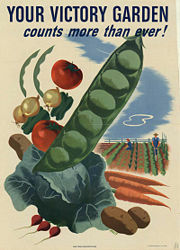 But even if I get 2 tomatoes and a handful of green beans, it’ll be worth all the effort.